At the UConn Health Surgery Center, we’ve taken outpatient surgery to a new level. The surgery center is a state-of-the-art facility designed exclusively for ambulatory surgery. It contains fully equipped operating rooms and postoperative patient care areas. For all its advanced technology and high quality care, the Center is a warm, friendly place where your health and well-being are our number one priority. To get to UConn Health, take I-84 East or West to Exit 39. Turn right at the first light (end of ramp) onto Farmington Avenue (Route 4) East. Continue three more lights (1 mile) and turn right into UConn Health. Upon arriving at UConn Health, proceed into the roundabout and take the third right. The UConn Musculoskeletal Institute is the second building on the right. A patient drop off lane is available at the ground level entrance. Parking is available in Garage 1. There is a ground-level entrance to the garage directly past the UConn Musculoskeletal Institute building on the right. 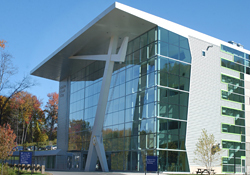 Parking and entrance for the UConn Health Surgery Center is located on the second level. 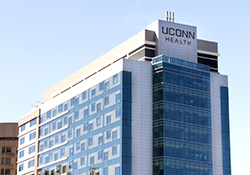 The UConn Procedures Center, located in University Tower at UConn John Dempsey Hospital, offers high quality care to patients who require hospital admission, as well as to patients who are having ambulatory surgery. Our goal is to provide our patients, and their loved ones, with a safe and comfortable surgical experience. Whether you are being admitted, or going home after surgery, you will be cared for by the same professional, highly skilled staff members utilizing the latest state-of-the-art technology. Entering from Farmington Avenue, proceed to the roundabout and follow the signs to the hospital. Bear left at the fork and continue up the hill. At the third stop sign, take a right to the hospital entrance. Patient drop-off and valet parking are available at the entrance. Visitor parking is available in Garage 3 or Lots F, G, and H.